Starting school can be an exciting time for a teenager: getting new school supplies, seeing friends again, and proudly wearing new clothes on that first day! Unfortunately for teens in foster care, their experience is full of hardships. On top of everything going on in their personal lives, they have to enter school with a generic, worn-down backpack and the same notebooks they used last year. Guild Mortgage in Santa Maria was inspired to help these teens start off on the right foot by supplying them with the essential items they need to feel some type of normalcy. “I remember meeting a former foster youth who shared with me the value of a quality hair brush,” shared CASA’s Recruiting and Outreach Director, Crystal Moreno. “This young woman had thick hair, and all of the brushes she was receiving would just break. It wasn’t until she had her own job at 17 that she could afford a quality brush.” Moreno challenged Guild Mortgage’s employees to keep this in mind and make sure that these teens were getting the quality items they need. “The children in the CASA program are not in foster care because they did something wrong. They are there because their parents either abused or neglected them,” commented Kim Colby Davis, Executive Director of CASA. Guild Mortgage set a goal of donating 30 backpacks, filled with essential hygiene and school supplies. The company’s 33 employees worked over 20 hours selling tacos, coffee, and going door to door in order to raise a grand total of $3,500 to pack the 30 bags with quality items. Even some family members of employees got involved. Loan Officer Marie Withers said three St. Joseph High School students put in four hours each in order to put the bags together. “I’m so proud that my staff was able to come together and give the kids these items,” stated Cyndi Nunez, Branch Manager of Guild Mortgage. 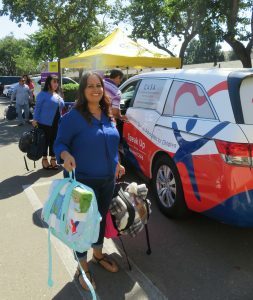 It was truly an act of compassion, Guild Mortgage employees held back tears as they loaded the backpacks into the CASA van. Aaron Pankratz, Associate Director of CASA, gave the employees insight into the incredible difference they were making when he said, “One of the challenges of being a CASA volunteer is finding a way to connect and meet the teens’ needs. It’s hard for them to talk about what they need; they tend to be self-sufficient. When their advocate can hand them something that has everything included, the advocate has a chance to connect with them, and it makes that teen feel important.” CASA volunteers spend at least an hour a week getting to know their child and to make sure their needs are met. Whether they need extra help in school, a check-up at the doctor, or new supplies, their CASA volunteer advocates for them in the court. It can be very troubling to have to deal with high school, a foster family, and court appointments when you’re just trying to be a teenager. These backpacks will help the CASA volunteers connect with their teenagers, so they can be a better advocate for whatever they need. Cyndi Nunez and her team at Guild Mortgage have set a great example of what one company can do to make an impact in the Santa Barbara County community. They not only considered what a teenager in foster care needs, but what they want. The Guild Mortgage employees made sure to get a variety of colors, designs, sizes, and styles that the teens could choose from. They took the time to special order many of the items, and that extra effort made a difference. Guild Mortgage went above and beyond for CASA.